NHPCU is pleased to introduce the newest enhancement to your checking account. MasterMoney is more than an ATM card and offers greater purchasing power. It is more convenient and flexible than an ATM card. The MasterMoney Card is not a credit card. It is a debit card. This means the amount of your purchase comes directly from your checking account. At the end of each month your purchases will appear on your checking account statement making it easier to manage your money. MasterMoney offers all the convenience of an ATM card, including 24 hour banking and it gives you the ability to make purchases from your checking account at 14 million locations worldwide. The MasterMoney Card is accepted anywhere the MasterCard logo is displayed. MasterMoney allows you to shop without carrying a lot of cash. There are no monthly or annual fees with MasterMoney Card. MasterMoney is better than cash! Better than checks! Better than ATM cards! Better get your NHPCU MasterMoney Card today! If you have not received a MasterMoney Debit Card from us, call or stop by to apply for one today. It's easy and fast and you will love the advantages and convenience. And it's free! 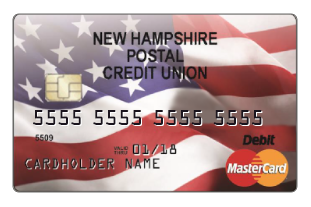 NH Postal Credit Union wants to help protect you and your money from identity thieves. If you've lost your MasterMoney card, please email us or call 888-244-9946 during business hours. If it is after business hours and you've lost your MasterMoney card, please call 800-472-3272 for immediate assistance.